A grieving New Jersey bishop remembered the reverend and state senator Clementa Pinckney, one of the nine people killed inside a historic South Carolina church Wednesday night, as someone who worked tirelessly to change the world for the better. Bishop Reginald Jackson of the St. James African Methodist Episcopal Church in Newark said he knew right away it was Pinckney's church, the landmark Emmanuel African Methodist Episcopal Church in the heart of Charleston's historic downtown district, when he heard of the massacre early Thursday morning. "That just wiped me out," said Jackson. St. James is a sister church to Emmanuel AME. Jackson said Pinckney, a 41-year-old married father of two, lived to help others, both as a pastor and as a state senator. Pinckney was kind to everyone, he said, and he likely showed kindness to the man who killed him, Dylann Roof. "On something like this, he would have no need to feel on guard, he was totally vulnerable," said Jackson. The eight others killed at the church have been identified as Tywanza Sanders, 26; Sharonda Singleton; Myra Thompson, 58; Ethel Lance, 70; Susie Jackson, 87; the Rev. Daniel Simmons Sr.; DePayne Doctor; and Cynthia Hurd, 54. Rev. Lanel Guyton at St. Matthew African Methodist Episcopal Church in Orange, New Jersey was Pinckney's fraternity brother in college and said Pinckney became a pastor at the age of 18. 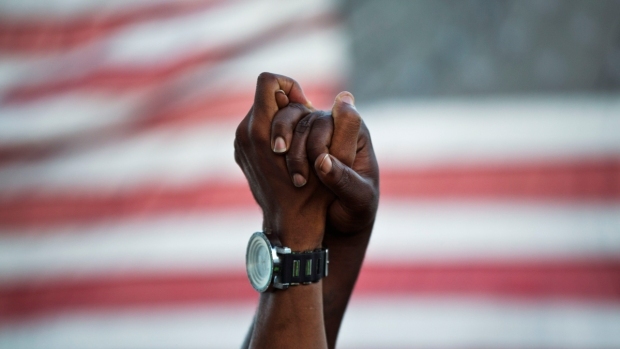 "We all knew, all six of us knew that Clementa Pinckney was destined for greatness," he told NBC 4 New York. Jackson said he wanted his friend to be remembered as "somebody that tried to make an impact, to make a better difference for people and the community." 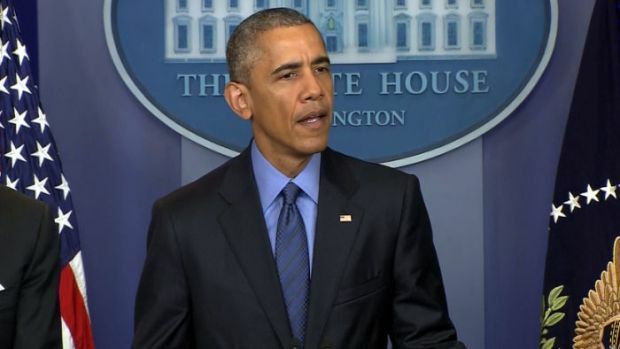 Obama: Church Shooting "Raises Questions About a Dark Part of Our History"
President Obama expresses sadness and anger over the shooting inside a Charleston, South Carolina, church that left nine people dead. "That's the best way to remember him, and I really think he succeeded," he said. Pinckney was elected to the state House at 23, making him the youngest member of the House at the time. "He never had anything bad to say about anybody, even when I thought he should," State House Minority leader Todd Rutherford told The Associated Press. "He was always out doing work either for his parishioners or his constituents. He touched everybody." President Obama and Vice President Biden also knew Pinckney; Biden remembered seeing him at a prayer breakfast last year and called him "a good man, a man of faith, a man of service who carried forward Mother Emaunel's legacy as a sacred place promoting freedom, equality, and justice for all." St. James in Newark was among the many churches in the tri-state area stepping up security after the attack. Pastor Ronald Slaughter said the church already spends thousands on armed guards, and now they plan to spend even more. "I have to alert my members on Sunday, don't be startled by the presence of armed security. They are here for your protection," he said. "The Heart and Soul of South Carolina Was Broken"
Gov. 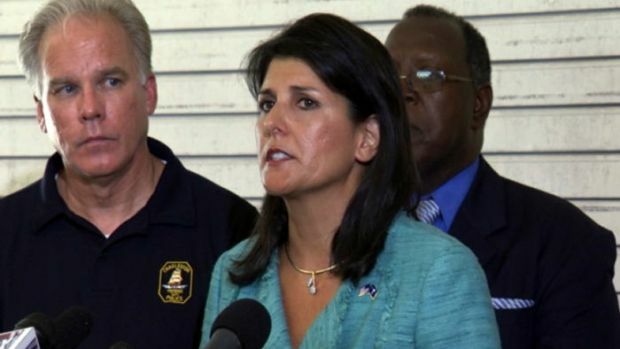 Nikki Haley delivers an emotional statement after the man suspected of killing nine people in a historic black church in South Carolina was taken into custody. NBC's Dave Wagner reports. Slaughter said church leaders are also planning on working with Homeland Security to train employees and parishioners on how to respond to active shooters. They prayed for help Thursday. "My daughter, who is 10 years old, before leaving for school today, says to me, 'Daddy, can this happen to you as well?'" said Slaughter. "That hits home." New Jersey's Essex County Sheriff Armando Fontoura said extra police were also being deployed immediately: "You will see more activity around all places of worship." 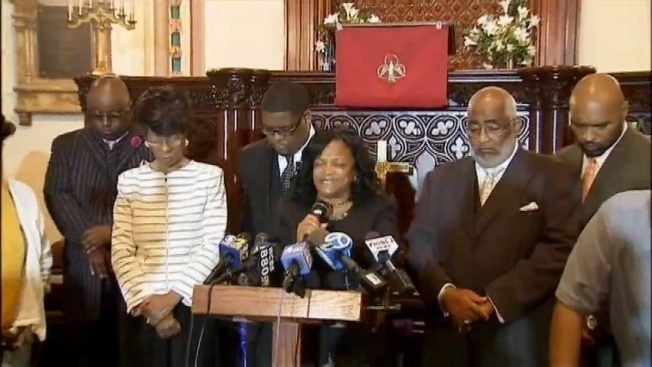 Attorney for Prison Worker's Husband: "He's in Shock Still"
In New York City, Mayor de Blasio said Thursday he plans to strengthen security at black churches and that the NYPD would be increasing patrols . The man suspected in the shooting, 21-year-old Dylann Roof, was apprehended Thursday morning more than 4 hours away in Shelby, North Carolina. De Blasio, speaking at an event announcing changes in traffic patterns at Central and Prospect parks, said there are no known current threats to city churches. Officials confirmed that additional police would be making rounds to houses of worship Thursday. "We in this city feel the pain of people anywhere in this country, anywhere in this globe, because we’re so connected to each and every part of the country and the world," he said. "There are so many people here who hail from South Carolina, and it’s a very, very painful moment for all of us." Roof, of Lexington, South Carolina, stayed for nearly an hour inside the church Wednesday night before shooting six women and three men at a prayer meeting, Police Chief Greg Mullen said. Roof was arrested at a traffic stop Thursday morning in North Carolina, Mullen said. "Acts like this one have no place in our country," said Attorney General Loretta Lynch, who announced a Justice Department hate crime investigation. "They have no place in a civilized society." Roof's childhood friend, Joey Meek, alerted the FBI after recognizing him in a surveillance camera image that was widely circulated, said Meek's mother, Kimberly Kozny. Roof had worn the same sweatshirt while playing Xbox video games in their home recently. Roof also displayed a Confederate flag on his license plate, she said. State court records show only one pending felony drug case against him, and a past misdemeanor trespassing charge. "I don't know what was going through his head," Kozny said. "He was a really sweet kid. He was quiet. He only had a few friends." The shooting evoked painful memories of other attacks on black churches. They were bombed the 1960s, when they served as organizing hubs for the Civil Rights movement. Many were burned by arsons in the 1990s. Others survived shooting sprees. This particular church, which was founded in 1816, had its own grim history: When a founder, Denmark Vesey, tried to organize a slave revolt in 1822, he was caught, and white landowners burned the church down in revenge. Parishioners worshiped underground until after the Civil War. Mullen said names of the victims would be released once families have been notified. Charleston Mayor Joseph P. Riley Jr. called the shooting "an unfathomable and unspeakable act by somebody filled with hate and with a deranged mind." "Of all cities, in Charleston, to have a horrible hateful person go into the church and kill people there to pray and worship with each other is something that is beyond any comprehension and is not explained," Riley said. "We are going to put our arms around that church and that church family." A few bouquets of flowers tied to a police barricade formed a small but growing memorial Thursday morning a block away from the church. Al Sharpton also condemned the shooting and had planned to offer a reward for information on the suspect before Roof was captured. The attack came two months after the fatal shooting of an unarmed black man, Walter Scott, by a white police officer in neighboring North Charleston that sparked major protests and highlighted racial tensions in the area. The officer has been charged with murder, and the shooting prompted South Carolina lawmakers to push through a bill helping all police agencies in the state get body cameras. Pinckney was a sponsor of that bill. Sharpton runs the National Action Network and is a talk-show host on MSNBC, which is owned by NBCUniversal, the parent company of this site.